Carrington is well-known to devotees of choral singing. Prior to coming to the United States, he was a creative force for 25 years with The King’s Singers, which he co-founded at Cambridge University. From 2001–2003 he was director of choral activities at New England Conservatory, and from 2003–2009 he was professor of choral conducting at Yale University and director of the Yale Schola Cantorum. With this Schola, in 2004, he presented an acclaimed performance of Biber’s Vesperae. Friday’s concert is to be an expanded reprise. Joining Maestro Carrington are Baroque violinist Dorian Komanoff Bandy and Bálint Karosi, organist and First Lutheran’s Minister of Music. The instrumental ensemble includes violin, gamba and two violas da braccia, with continuo played by violone (8′), theorbo and chamber organ. Canto Armonico, originally an early music choral group at Harvard, has nineteen singers (SATB 6-5-4-4), many of whom will be heard as soloists. In this concert presentation of music for an elaborate vespers in Salzburg, we will hear primarily music by Biber (1644-1704). 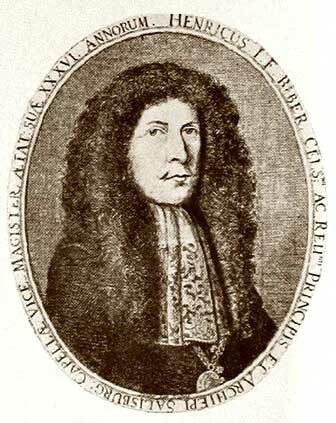 A virtuoso violinist and then a composer, Biber worked his way through advancing music appointments in Salzburg and was appointed Kapellmeister in 1683. He is widely famous for his great contribution to the Baroque violin repertoire, his Mystery (or Rosary) sonatas, one of which Bandy will play at this concert. BMInt readers will find detailed discussions of Biber and the Mystery sonatas in our reviews here and here. Rupert Ignaz Mayr (1646-1712) was a German violinist, composer and Kapellmeister in Munich at the court of Maximilian II Emanuel, Elector of Bavaria. He studied in Paris with Lully, yet his church music shows an Italian influence. Voices and instruments shared his musical themes equally and he used effective word-painting. Giovanni Legrenzi (ca. 1620-1690), of Venice, a prominent composer of opera, vocal and instrumental music, and an organist, wrote liturgical music with a distinctly dramatic character. Leopold I (1640-1705), both a patron and accomplished musician, was Holy Roman Emperor, King of Hungary and Croatia and King of Bohemia. Johann Heinrich Schmelzer (ca. 1623–1680) was an Austrian composer, violinist and musician at the Habsburg court where he was appointed court violinist in 1649 and enjoyed a close relationship with Emperor Leopold I. He made substantial contributions to the development of violin technique and is believed to have been Biber’s teacher. Georg Muffat (1653 –1704), of Scottish descent, studied in Paris between 1663 and 1669, where his teacher is often assumed to have been Lully. He became an organist, then studied law and lived in Vienna, Prague and finally Salzburg, where he worked for the archbishop for some ten years and surely would have known Biber. 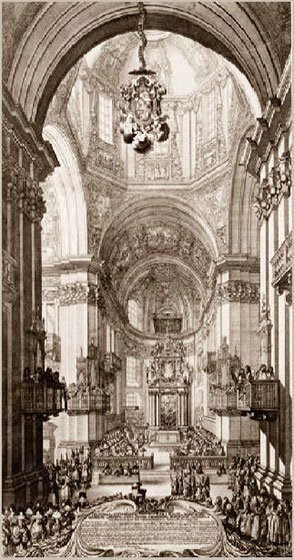 In 1680 he moved to Italy; in 1690 he became Kapellmeister to the bishop of Passau. Obviously a cosmopolitan composer, he played an important role in the exchanges between European musical traditions. The vespers concert will begin with Biber’s String Sonata in G Minor No. 3 from a collection of twelve sonatas called Sonatae tam aris quam aulis servientes, written in 1676 for his employer, Maximilian Gandolph von Kuenburg, Prince Archbishop of Salzburg (1622–1687). This sonata is scored for two violins, continuo and three so-called violas, which for Biber signify any stringed instrument that’s not a violin. (This concert uses one gamba and two violas da braccia). The tuning will be at a lower, “Baroque” pitch, and the chamber organ will be tuned in 1/6 comma meantone. The first vocal music is the exhortation “Deus in adjutorium meum” in a setting by Mayr. From Biber’s Vesperae Longiores ac breviores, come settings of the five Psalms appointed for Vespers—Dixit dominus, Confitebor tibi, Beatus vir, Laudate pueri and Laudate dominum. However, the Antiphon before each Psalm may be replaced with an antiphon substitute, according to the edition by Scottish musicologist/violinist Brian Clark. During the 17th c. in particular, it became popular for the Psalm antiphons to be replaced by concerted music such as motets and sonatas, while the priests recited the liturgical texts. Muffat’s Toccata Prima, a brilliant organ piece, is the first of these. A second Antiphon substitution is Sonata VII a Cinque, from Sacro-Profanus Concentus Musicus, 1662, by Schmelzer, as much an innovator in his day as Biber was a generation later. As the third Antiphon substitution, Dorian Brandy will play Biber’s 2nd Mystery sonata, “The Visitation”, Mary’s Visit to Elizabeth, scordatura a e’ a’ e”. The collection of sonatas survives in a manuscript copy with engravings accompanying each of the sections and portraying the depicted scene. “The Visitation,” is mostly in double stops, perhaps to signify the meeting of the two mothers and the two not-yet-born boys. Chosen as one of the Los Angeles Times’s “101 Remarkable Young People,” Bandy, new in Boston this year, holds degrees in baroque violin and conducting from the Royal Academy of Music (London) and in musicology and comparative literature from Cornell University. Leopold’s (Holy Roman Emperor) lovely “Ave maris stella” follows the five Vespers Psalms. The seven verses are partitioned among the soloists and the chorus. Mayr’s motet “Sancta Maria, Mater Dei”, for soprano and strings, from his Op. 3, Sacri concentus psalmorum, antiphonarum, etc., of 1681, will be sung by Canto Armonico member Claire Raphaelson. This piece is the Antiphon substitute before the Magnificat setting by Biber. The final choral piece is Legrenzi’s Marian hymn for Advent, “Alma Redemptoris Mater,” the only vocal work without string accompaniment. The Vespers concert will conclude with Karosi’s performance of Muffat’s Toccata Secunda. In addition to Raphaelson, other Canto Armonico soloists are Lucy Bergin, Elise Groves, Julia Cavallaro, Stephanie Kacoyanis, Jonas Budris, Joel McCoy, Ari Nieh and Ian Pomerantz. The presenter wishes to thank Cheryl K. Ryder, Bálint Karosi and the First Lutheran Church of Boston for their roles in preparing and presenting this concert.